Until 2008 or so, Rosarito Beach, about 10 miles south of the United States-Mexico border in Baja California, was a hot spot for kids on spring break looking to drink tequila, eat cheap lobster dinners and party the days and nights away. Then the economy crashed and crime reached epidemic proportions and suddenly the streets went from 24 hour fiesta to ghost town. Until recently, that is. Today Rosarito is a thriving place for families, foodies and small businesses. A visit to the only winery in Rosarito, Claudius, provides a glimpse into the innovation and resilience desperate (and resourceful) business owners in the area have gone through. Julio Benitez, a native of Segovia, Spain, established the business just four years ago, and only this year is the label releasing its first bottles onto the market. The vinyard caters primarily to aficionados who can take classes at a small wine-making school, and a tasting room and restaurant for enthusiasts who would rather savor it. “The grapes come from the Valle de Guadalupe. We offer a cabernet, merlot, Tempranillo, Syrah and some whites. All the wine is aged in French oak barrels and sold primarily in Mexico. Of course there’s work being done to assure U.S. sales soon. 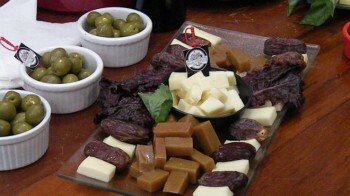 The food we pair our tastings with is provided by the family-owned produce company called Baja Produce,” says Benitez. Baja Produce also operates a small store on the town’s main road that showcases its certified organic produce and packaged items. When Robert Redford was in Rosarito recently shooting the film, “All Is Lost,” he was a regular customer. Located in rolling hills above the town, Rancho Las Ilusiones is the go-to spot in Rosarito for brunch. A farm owned and operated by the same family for the last 30 years, the restaurant began as just a small stand serving tacos with carne asada, then added a large palapa and finally the restaurant. All the ingredients in the dishes are grown or raised on the farm—vegetables, citrus, rabbit, lamb, chicken and goat. The house specialty is conejo machaca – a.k.a., rabbit meat that’s been hacked up and slow cooked. Although Rosarita is best known for the little fishing towns of Puerto Nuevo and Popotla, both bustling with seafood restaurants serving lobster and shrimp dinners, Rosarito’s most famous taco stand is Tacos El Yaqui, claimed by many to serve the best beef tacos in Baja. The Yaqui tacos, also called “Tacos Perron,” are prepared with Arrachera-style beef that’s cooked on a wood-fired grill, fresh guacamole, cheese, salsa, pinto beans and onions and wrapped in a homemade flour tortilla. One sure sign of how good the Yaqui are is the crowds of locals and tourists in the know who line up to get them. Another meat-centric spot is Rancho Guacatay, an organic meat farm which provides venison, rabbit, lamb and quail to the restaurant El Nido, located a few feet away from the recently renovated Rosarito Beach Notel. After six years of economic doldrums, the mayor’s wife, Liliana Mendoza, said she was thrilled tourists are finally coming back to Rosarito. Shaking hands with everyone at the area’s first annual craft beer festival, the town’s “First Lady” beams as locals come flooding into the event with children in tow, and hipster Americans flock to booths for tastings. It’s clear Rosarito is retro now. People are there to enjoy the craft beer movement, the freshly grown food, and the quite pace of the small beach town. Rebekah Sager is a nationally published lifestyle and culture writer. She’s a regular contributor to Fox News Latino. Follow Rebekah on Twitter @Rebekah_Sager.